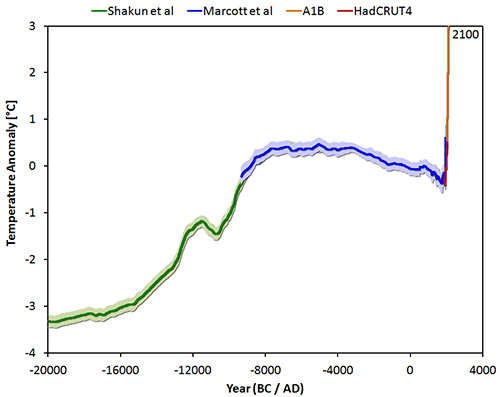 The pattern of temperatures shows a rise as the world emerged from the last deglaciation, warm conditions until the middle of the Holocene, and a cooling trend over the next 5000 years that culminated around 200 years ago in the Little Ice Age. Temperatures have risen steadily since then, leaving us now with a global temperature higher than those during 90% of the entire Holocene. This warming after the last glaciation coincided and probably triggered the rise of the agricultural based culture that our civilisations are still highly dependent on today. Since then, as can be seen in the chart from Jos Hagelaars which is a composite of 3 studies in different periods , the average world air temperatures haven’t varied that much – at least until recently. The AB12 line at the end of the chart is a rather optimistic* projection from the IPCC AR4 report projecting the coming century. Since the atmosphere and oceans together constitute a heat transfer mechanism called weather, and we are looking forward to a severe shift in climate, I’d anticipate that the agricultural foundation of our civilisation is going to have problems that it has never seen. The average resolution of the data with a reasonable level of confidence on the Marcott study is only at about 120 years because much of the period relies on measurements taken from the debris and sediments left by the natural world. Each sample comes from long ago and typically has been churned by biological systems and erosion, and in any case reflects local climate conditions. So what is seen is for each point on the graph is a composite of samples across many locations and across decades rather than a year by year record. 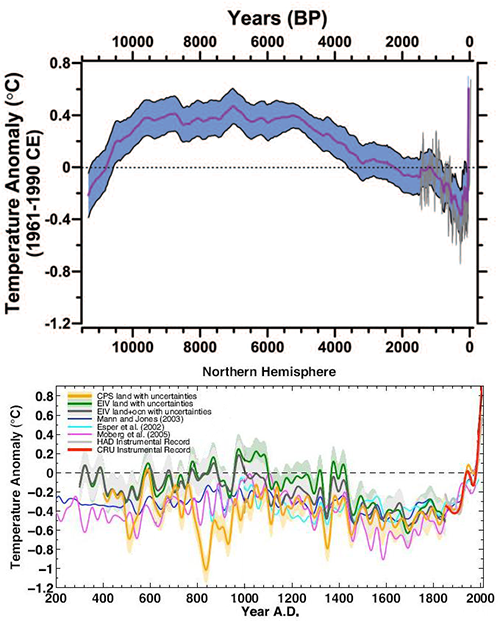 It overlaps with the finer grained data from the past ~1500 years from Mann et al 2008 derived in part with from still living or fossilized trees and actual instrumentation after our ancestors started to use thermometers. And the expansion of the studies used to make up that is below that. There was such unusual interest in the paper that Marcott et al that they put out a response in which they explained some of the underlying science for the people unfamiliar with the techniques. But as dana points out the difference between actual skepticism and the rubbish that many of the more pathetic scientifically illiterate climate skeptics like Ian Wishart practice. It’s worth taking a moment here to reflect on real skepticism. Spending literally dozens of blog posts attacking a study because its results seem inconvenient is not real skepticism. Comparing climate scientists to the mafia is not real skepticism. Nitpicking minor details in press releases and media articles while ignoring the discussion in the paper itself is certainly not real skepticism. If you want an example of real skepticism, look no further than Tamino’s Open Mind blog. Tamino read the Marcott paper, noted they had expressed doubt about the robustness of the final uptick in their proxies, looked at the data, identified the proxy dropout issue, tried some new analyses, and found that the proxy uptick is probably real but probably smaller than it appears in the paper. Also see similar efforts by Nick Stokes. These are the approaches of real skeptics. At least the manufactured controversy over the Marcott paper has served to show who the real skeptics and “honest brokers” are. The irony is that the climate contrarians are being their own worst enemies here. A ‘hockey stick’ shape means less past natural variability in the climate system, which suggests that climate is relatively stable. It’s revealing that in their zealotry to deny that the current global warming could possibly be unnatural and unprecedented, the contrarians are actively trying to undermine their only potentially valid remaining argument against serious climate mitigation. Nevertheless, all signs indicate that the current rate of warming is very rapid, probably unprecedented in the past 11,000 years; that if we’re not at the highest temperatures during that timeframe, we will be soon; and that despite the contrarians’ best efforts to argue otherwise, we’re not yet doomed to catastrophic climate change. But Dana181 is an optimist about how resilient our civilisation is, especially in it’s agricultural underpinnings. It is pretty clear to anyone like myself has a background in earth sciences that the IPCC reports are conservative because they are limited to solid confirmed data. But we’re still severely limited in what we know about what affects climates past, present and future. But what we can be sure of is that the weather will get a lot more variable and extreme as the energy in the ocean and atmosphere builds up. It could be that this happens slowly enough for farming to adjust. But when you look at the dependence of farmers in extreme climates around the world who are reliant on regular weather like the monsoons in Bangladesh or the mild winters in the gulf stream washed areas like Europe, it is clear how reliant we are for food on our relatively unchanging climate of the past 11,000 years. I know lets keep chucking babies at all our problems, we all know if there is a problem all we need is more people to solve it. Like that book, Burn Baby Burn. Sacrifice the next generation so that the present one can have comfort, convenience and entertainment …. leaf blowers, patio heaters, SUVs. two overseas holidays a year…..